Since we are off to sunny Florida soon, we celebrated Christmas with the in-laws. Family time...gotta love it! I enjoy watching people open gifts even more than I do opening my own gifts. I had been sitting a while taking it all in...most gifts were already open...when my daughter asked me what I got. I had no clue...I hadn't even touched the bags at my feet! I was so busy watching everyone else! And it was a fun site to see, that's for sure. Everyone appreciated my homemade gifts, except my husband's grandmother. Her reaction was the only downer of the day, and I have come far enough in my growing up to realize it was her problem, not mine. I saw my daughter watching me, and I know she was noticing Grandma's rude behavior, so it was a great chance to talk later about how rude she was and how important it is to show appreciation of a gift even if we don't like it because the person who gave it to you put thought and time into it. 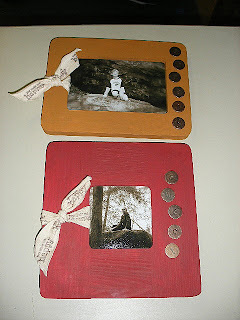 The picture shows the frames I made for her. Ironically, I think they were one of my favorite gifts and debated keeping them for myself! I do plan to make something similar for myself. I think the pictures in the frame are a big part of why I like them so much. They are my kids, and I love the sepia affect. The twill ribbon has "You make me happy" stamped on it. And the coins on the right say "sweet" for my daughter's pic and "strong" for my son. There are no special techniques here...pretty simple and straight forward. Enjoy!